There aren’t many games that teach you skills, real, translatable skills but Phonopath is something of a unicorn. It’s a puzzle game with a simple concept – listen to a soundbite and work out the password it contains to unlock the door to the next puzzle. Where it gets interesting is that it’s up to you to work out what sort of audio wizardry you need to apply to the sound to crack its code. By its conclusion you’ll be an audio cryptographer. There are 28 stages to work through. Some will require you to manipulate the sounds in an editing program, others are based on music theory, at every turn you’ll have to research something new to solve the puzzle. You’re free to download each audio clip and do with it what you need. That might be audio reversals, pitch shifting, phase cancellation, working out morse code. All manner of fun things. 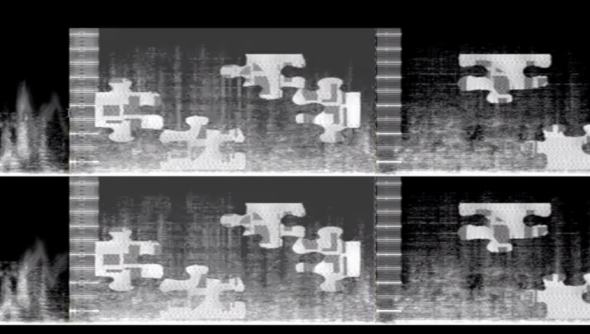 He describes one absolutely nuts puzzle in which you need to examine the sounds spectrogram. Doing so reveals a ghostly image of jigsaw pieces, you then must edit the audio chunks together so that the jigsaw pieces link up. Regarney’s submitted Phonopath to the IGF where I’d say it’s a shoe in for Excellence in Audio. Phonopath is free to play in your browser. Get to it, sleuth.